For more than a year, Jane Palmer had been a vocal critic of the Vermont Gas pipeline that would carry natural gas from Chittenden County south to Middlebury — through the farm where she and her husband, Nate, live in Monkton. Like other pipeline critics, she felt the company wasn't treating landowners fairly, and that fracked natural gas was the wrong energy solution for Vermont. Palmer decided her message wasn't getting through. 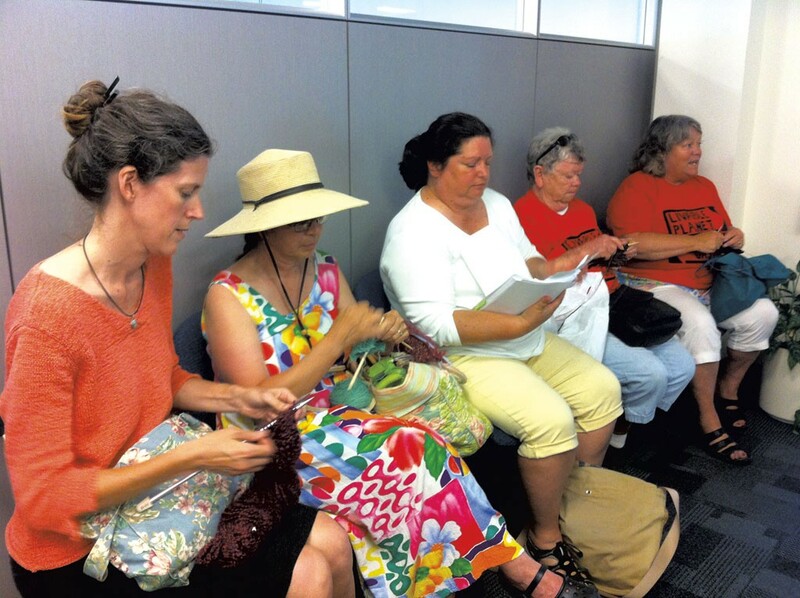 So she went to the gas company's South Burlington headquarters, knitting needles in hand, and staged a "knit-in" along with four other women who were demanding to meet with company execs. When the office closed for the night, Palmer refused to leave. South Burlington police arrested her and charged her with trespassing. Palmer's arrest came after months of protests, heated hearings and controversy over the pipeline, which is divided into three phases. The first, stretching from Chittenden County to Middlebury, earned approval from the Vermont Public Service Board last December. The second, which would carry gas to the International Paper plant in Ticonderoga, N.Y., is still under consideration at the PSB. The third would take gas from Middlebury to Rutland. "We're reluctant activists — because they've forced us to be," said knitter Mary Martin, a Cornwall resident whose home is along the proposed route of the second phase of the pipeline. UPDATE: Vermont Gas dropped the charges against Palmer — while she and her husband were trying to set up a meeting with company reps. Several months later, 64 people occupied Gov. Peter Shumlin's office in an organized sit-in to protest the pipeline. State police dropped the charges against all of them in early December. The Shumlin administration is taking an increasingly active role in the pipeline controversy. After a series of meetings with landowners and activists, it sent a letter to Vermont Gas in late November asking the company to stop further landowner negotiations until March 2. The company agreed to put on the brakes — spokesperson Beth Parent said they won't initiate any eminent domain proceedings for the time being — but didn't commit to a date. Meanwhile, there's another kink in the pipeline: In September the PSB decided to postpone the proceedings on phase two of the project until next year because of ongoing concerns about cost overruns on phase one, and because the company had failed to obtain federal approval to bring gas to New York State. Palmer and her husband still haven't reached an agreement over an easement that would allow Vermont Gas to build its pipeline across their land. Parent said earlier this month that the company had reached agreements with about 80 percent of the 221 landowners on the route, and was in active negotiations with another 15 percent. Parent said that construction on phase one isn't running behind schedule — yet. "We were hoping to get to Severance Corners by the end of next summer," she said, acknowledging that, come spring, the company may have to reassess its construction timeline.